To all you Faces lads out there: you need not much to dial in a good Faces guitar sound!Take your favourite Humbucker guitar and place the BSM RW-F between your guitar and amp. Did I say amp? Hell, yeah! Any good tube amp will do, but you'll get the best results with 40 Watts or more amps. (Fender, Hiwatt, Ampeg, Marshall, Vox). Set the amp fairly clean or with a hair of tube breakup. Hit the RW-F and set it´s volume pot half cranked. Roll back your guitar tone knob from 10 to around 8 (with Strats and Teles to ca. 7). Hear the voice of Rod Stewart in your head screaming "guitar" and there you go with a perfect Woody sound. 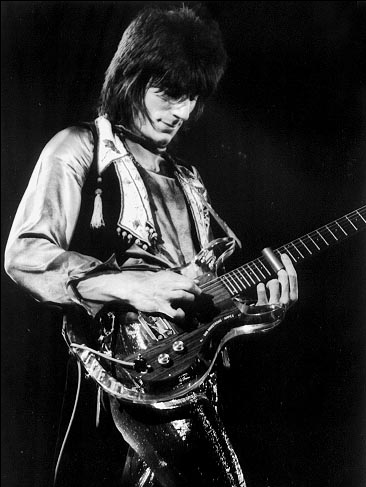 Ron Wood is one of the most underrated guitar player of all times. Period. 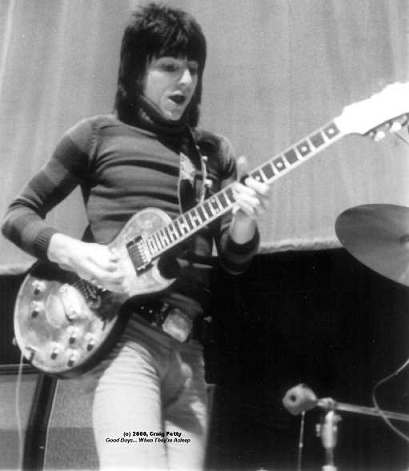 He is not the fast virtuoso gunslinger with an outstanding technique - leave that kind of playing to all the Gilberts and Vais in the world - he is just a brilliant player who mixes a solid, groovy rhythem style with melodic lead playing that suits the song and not the ego of the guitar player. He´s a mighty fine slide player and is also capable of strumming and picking some nice licks on his acoustic Gibson Super. Don´t believe me? Listen to his fantastic playing on classic Faces tunes like "You're so rude", "Stay with me" or "Ooh la la"! Listen to the unmortal Rod Stewart hymne "Maggie May" and "You wear it well". Of course all you Woody fans out there know he started his career as a bass player in the legendary Jeff Beck Group with Rod Stewart on lead vocals. And we all know that since 1976 Mr. Wood is playing guitar in a little English Blues Band called The Rolling Stones - but that´s not of interest here! BSM mastermind Bernd C. Meiser created a new Treblebooster for his famous signature Booster line: let's have a big welcome for the new "RW-F" which is a typical Meiser short form and stands for Ron Wood - Faces! 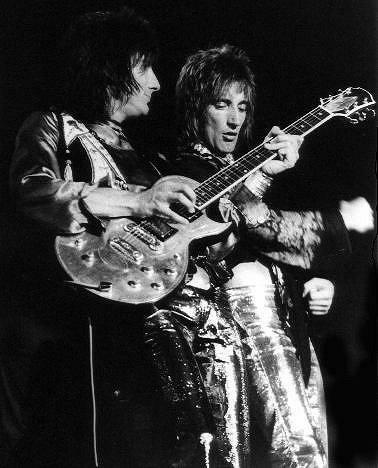 As a long time lover of The Faces (Mk II with Ronnie Lane on bass, Kenney Jones on drums and Ian MacLagen on keyboards) Mr. Meiser thought that the time was right to honour the glorious guitar sound that was Ronnie Wood´s trademark when he played with the Faces from 1969 - 1975. Which leads us to the all important question: What gear was Ronnie using during his time with the Faces? 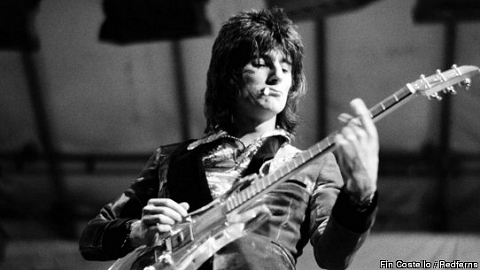 Ron Wood has used dozens of different guitars over the last forty years of his amazing career. 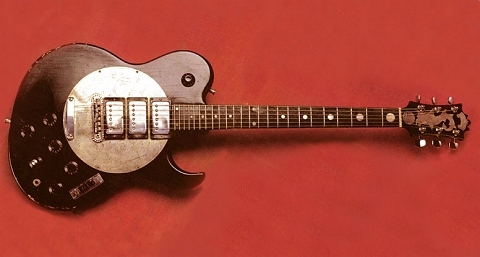 He was seen with all kinds of Fenders, Gibsons, ESPs, Duesenbergs, Versouls - but with the Faces he was famous for his Zemaitis´, The Ampeg Dan Armstrong Lucite and his Strats. In fact he was the one who turned all the Rock Stars on to get a Zemaitis. His two legendary Zemaitis guitars are the "Disc Front Model" with three Humbuckers from 1972 and his "´71 Metal Front Model". 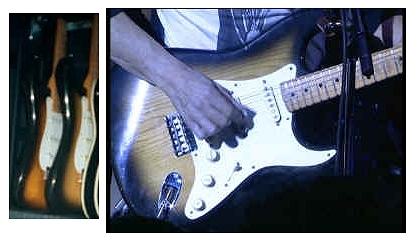 Although his roadie Johnny Starbuck is quoted: "Ronnie plays his 1955 sunburst Fender Stratocaster (Ronnie has two look-alike Sunburst Strats. One is a 1955 and the other is from 1956. The '55 is thinner and lighter, the '56 has a fatter neckshape) more than any other guitar!" you´ll see him mostly playing the Zemaitis´ and the Dan Armstrong with the Faces. 1969 was a year giants (like Hendrix, The Who, Cream, Stones or Led Zeppelin) rocked the earth, and they wanted big amps. Stadiums and outdoor festivals was where the action was-Madison Square Garden for chrissakes. Fifty watts just wasn't enough to move that chick in the 61st row in her hand-embroidered bellbottoms. It wasn't as if nobody was filling the void-witness the stacks of Marshalls, mountains of Hiwatts, and truckloads of Dual Showmans doing more to promote tinnitus in a single generation since World War II. Only In America? Ampeg needed to compete. The team of amp designer Bill Hughes and Roger Cox-with input from Bob Rufkahr and Dan Armstrong-set about to create what Cox referred to as "the biggest, nastiest bass amplifier the world had ever seen." Using the same sort of madness that drove Dr. Frankenstein, the team came up with a 300-watt all-tube phantasmagoria they called the Super Vacuum Tube-or SVT, to save on vowels. To fully grasp the monstrosity of their creation, the SVT's 300-watt output stomped the deafening 200-watt Marshall Major by a full 100-watts! Unveiled at the 1969 NAMM show in Chicago, the SVT head alone weighed 95 lbs and contained fourteen tubes, six of which were massive 6146 power tubes. To heat all those tubes, massive transformers with magnetic fields powerful enough to cause genetic mutations were necessary. And what kind of speakers were able to handle all that power? Nothing less than two cabinets sporting eight ten-inch speakers and weighing 105 lbs. each. After surveying his creation, Cox was actually concerned about potential liability-when your engineers warn of the possible harm their designs could cause, you'd better listen. Ampeg's management did and devised a warning label which read:?? "THIS AMP IS CAPABLE OF DELIVERING SOUND PRESSURE LEVELS THAT MAY CAUSE PERMANENT HEARING DAMAGE." And if it was good enough for the Stones, it sure was for the Faces! But what´s so special about these Ampeg monster amps? Well, you tone freaks - let´s pass the word to Mr. David Wilson of the ToneQuest Magazin (subscribe today and I promise you won´t regret it!) and his take on the Ampegs: Few sounds in the history of Rock have held up as well as the Ampeg V2 (and VT22, V4, VT40, and SVT) which became instant classics on records of The Faces, The Rolling Stones or Queens of the Stone Age. Hear these mighty amps roar with their earthy, midrangey, swamp tone! The RW-F: You might think at this point: what the hell want me the author to do? 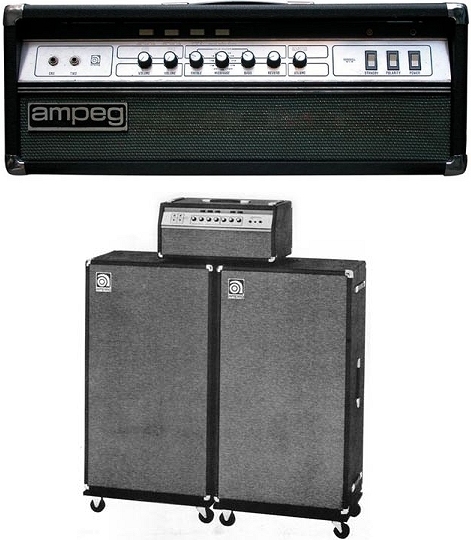 Buying a heavy tank Ampeg which will blow out the roof and keeps me straight on the road to deafness? Will Mr. Meiser pay my Roadies? Cool down, please! And have a close look at the BSM RW-F Treblebooster ! This little unit will not crack your spine neither your budget! But it delivers those thick, earthy overdriven tones with lots of midrange and punch to cut through the mix of any band! Take your Humbucker loaded guitar and plug the RW-F between your amp and guitar - voila! You get an instant Faces sound no matter which amp you use. I´ve tried the RW-F with a fantastic Tonehunter Main Offender Amp with two 5881 power tubes. I´ve set the amp clean with just a hair of breakup and stepped on the BSM RW-F . The RW-F has only one volume (or call it "gain" if you want) pot - but between zero and cranked are dozens of different sounds because the more you crank it your amp will be pushed into "sag" (power tube saturation!!!!). Now discover the magic of your guitar volume and tone pots.....roll them back and forth and find another bag of sounds from clean to dirty! 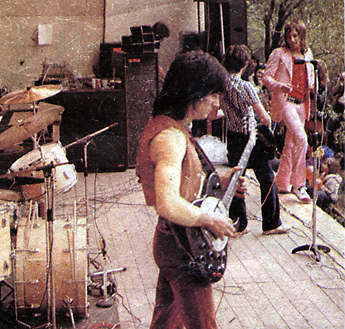 If you - like Ron Wood - are using a Strat very often don´t be afraid! My main guitar is a Telecaster and I compensate the more trebly sounding singlecoils just by rolling back the tone pot of my guitar. Ooh la la.........there you go! Dear Bernd C. Meiser, I have to say thank you for the great RW-F....at least it was time that somebody honors the skills and sounds of a truly great guitar player: Mr. Ron Wood! Written and researched by Till Hoheneder, Germany´s only comedian who´s music comedy group Till & Obel ever had the honour to be recorded by the legendary WDR Rockpalast. He´s now an independent author and still performing solo or with his band "Till & Die Altobellis". If you want to contact Till, please send him an email through his webpage.